When I came home in the rain…. This entry was posted on Friday, May 8th, 2009 at 7:06 am and is filed under Family News, Motivation. You can follow any responses to this entry through the RSS 2.0 feed. You can leave a response, or trackback from your own site. Happy Mother’s Day to U! 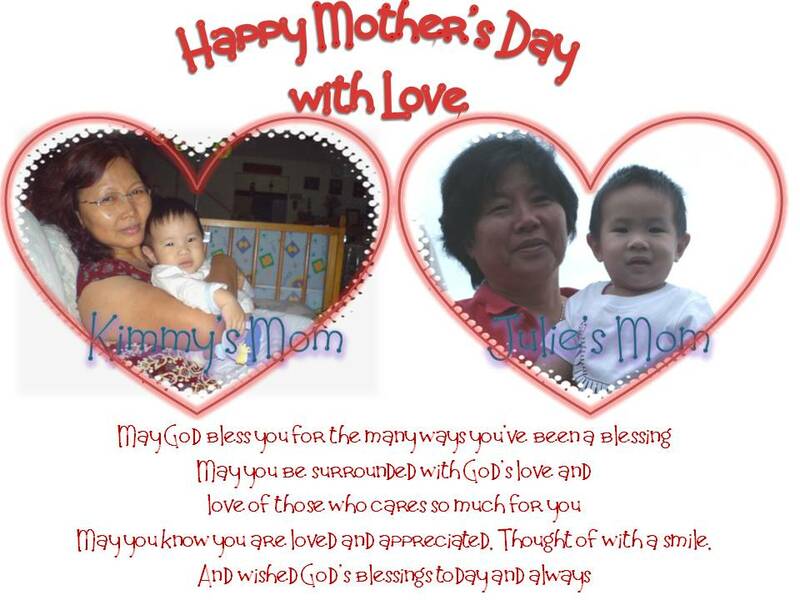 Happy Mothers Day to you, Julie.. Happy Mothers Day to you Julie. Enjoy your Mother’s Day too! here’s also wishing you a HAPPY MOTHER’S DAY! Happy Mother’s Day to you and all the mummy readers here! 🙂 You deserve all the hugs and kisses from your little ones tomorrow and everyday! Happy Mothers’ Day to you Julie! happy mother’s day julie! hey can i get your soya bean longan recipe? email me: [email protected] when you have some time la. thanks! A touch story… Greatest love of a mommy.